≪Weber’s cereus≫, genus honouring Frederic Albert Constantin Weber (1830-1903), French botanist who described several species during the French military expedition in Mexico in which he took part from 1864 until 1867. A genus of epiphytic or epilithic plants, reaching up to 2 m long; stems first flattened and hanging, variable, thin, then having 3-6 angles or cylindrical and often aerial roots. Spines usually setose to finely aciculate. Flowers nocturnal, self-sterile, appearing laterally, generally rather large (3-6 cm long), funnel-shaped, nectariferous glands under the areoles, with a hairy pericarpel, white, outer segments of the perianth greenish, with a sweet fragrance reminiscent of plum, or very unpleasant, pollinated by bats (Glossophaga soricina, G. commissarisi, Hylonycteris underwoodi, Lichonycteris obscura). Fruits spherical to ovate, pink to red or yellow to greenish, having or not having hairs or fine spines, with white or purplish red pulp. Seeds roughly egg-shaped to pear-shaped, more or less shiny, black or brownish, sometimes with an envelope of mucilage. 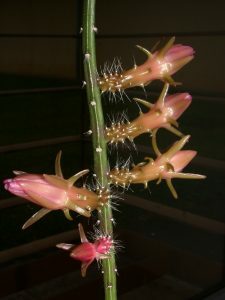 The genus Weberocereus grows mostly in tropical rainforests, from the sea level (W. bradei), often very close to rivers or to the ocean ( W. tunilla), up to 2500 m in altitude (W. tonduzii). Despite a significant disjunction, the genus was apparently not found in Colombia. Costa Rica (Alajuela, Cartago, Guanacaste, Heredia, Limon, Puntarenas, San Jose), El Salvador (Ahuachapan), Ecuador (Chimborazo), Guatemala (Chimaltenango, Quiche, Sacatepequez, Suchitepequez), Mexico (Chiapas), Panama (Bocas del Toro, Colon, Darien).